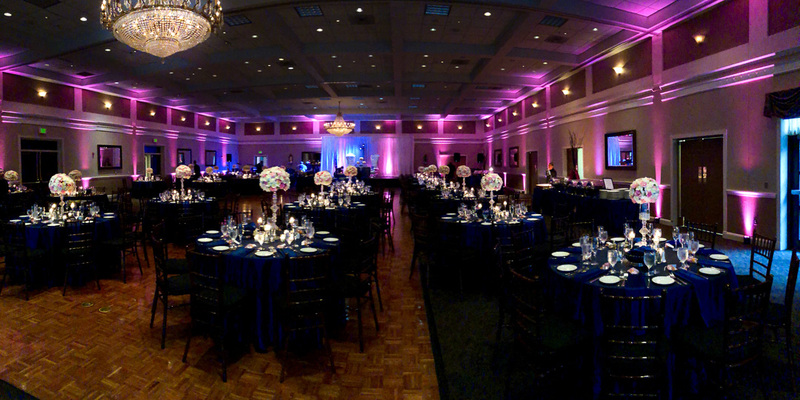 The Ten Oaks Ballroom is a beautifiul and elegantly appointed ballroom with crystal chandeliers and the largest dance floor in Howard County. The ballroom can seat up to 400 guests or can be reconfigured to accomodate smaller, more intimate ceremonies. A small landscaped patio is ideal for photo shoots. Tables and comfortable chairs are included. 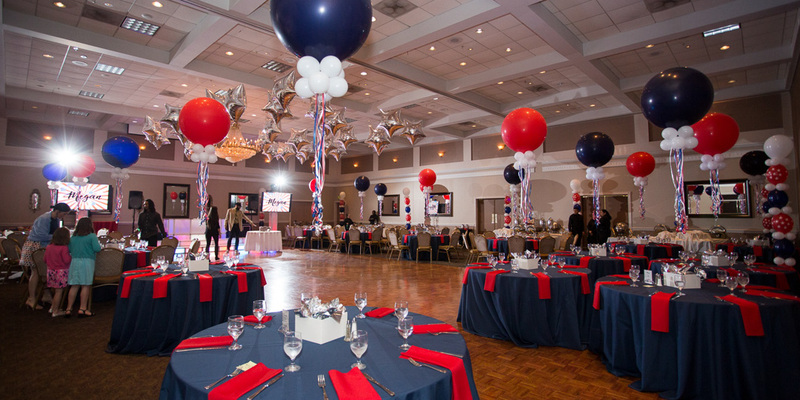 The Ten Oaks Ballroom is ideally suited for Bar and Bat Mitzvah celebrations of all sizes. The ballroom can be configured for theme events or cocktail offerings. A built in projection screen is available for displaying video and photo slideshows. A large attractive lobby with comfortable seating and a working fireplace can be used for photo opportunities and more. 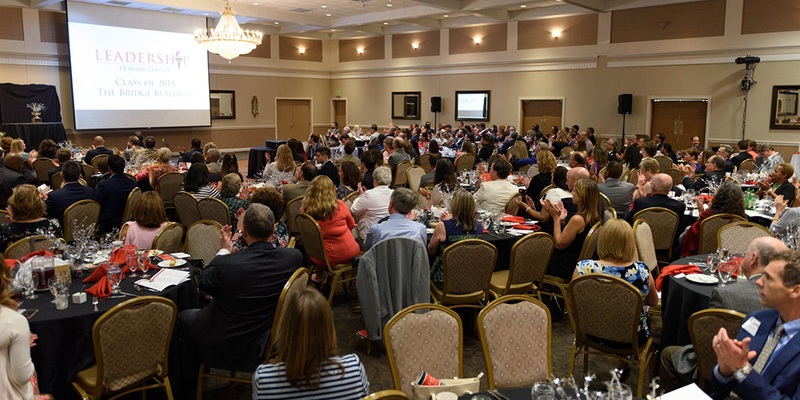 The Ten Oaks Ballroom offers flexible functional space which is ideal for business meetings, conferences, training sessions, and more. The ballroom can be divided into three separate rooms that can be used for individual functions such as break-out rooms, and each is individually wired for sound. The rooms can be rented separately to accommodate smaller groups or events. We have business hours in the lobby from 10am – 3pm on Mondays, Tuesdays, Thursdays, and Fridays, and evenings and Saturdays by appointment. Please get in touch with us to schedule an appointment or let us know you’re coming by! The finishing touch on every special event at the Ten Oaks Ballroom. 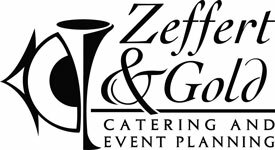 Zeffert & Gold Catering and Event Planning is a leading catering service provider in the Baltimore, Maryland – Washington, DC metropolitan areas. For over 25 years, we have built our reputation on quality, accumulating praise for our exceptional service and fresh food. We pride ourselves on creating imaginative, elegant events through a process that is fun and friendly. Putting on the Ritz is one of Baltimore, Maryland and Washington D.C.’s largest event catering companies. Today, Putting on the Ritz specializes in a variety of cuisines and service styles. From the moment of first interaction with one of our dynamic sales representatives until the last guest’s departure, our clients are treated with respect and enthusiasm. Want to schedule a time to come see the ballroom in person, or have other questions for us? Please fill out the contact form below and we will get back to you soon. Thanks! We offer plenty of free parking and our venue is handicap accessible.